Another lost continent was added to the Theosophists’ multiplicity of sunken lands in the 1920s by an Anglo-American occultist, James Churchward (1851-1936), who claimed to have discovered evidence for a sunken landmass in the Pacific Ocean named Mu. Churchward was born in Hatherley, Devon, and liked to be known as ‘Lieutenant-Colonel’ (and although no-one seems to have discovered where he served, his claims to knowledge of India and/or Tibet suggest that it was in British India: at least one author (Kolosimo 1971 , 56) makes him a Colonel in India during 1868, at the impossibly tender age of seventeen!). By 1872, he was living in Sri Lanka and borrowed money to finance a tea plantation in 1879 (he appears as owner of a plantation in a directory published in Colombo in 1878). Two years later, he was back in England, where he is listed in the census of 1881 as a tea planter, now living in Croydon (Surrey); before the end of the decade, though, he was living in Brooklyn (USA). After writing a Big Game and Fishing Guide to Northeastern Maine, published in 1898, he published five volumes during the 1920s and 30s, dealing with his ‘discovery’ of the ‘lost continent’ of Mu (The Lost Continent of Mu, The Children of Mu, The Sacred Symbols of Mu, The Cosmic Forces of Mu and The Second Book of the Cosmic Forces of Mu). The first volume (published in 1926) set out his theory, employing a “vast knowledge of science, ancient art and history, mythology and the occult” to recreate the splendour of this antediluvian world. 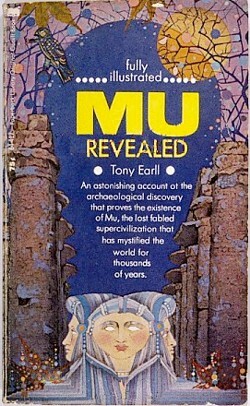 Churchward claimed that he had discovered the existence of the long lost continent of Mu from his reading of ancient texts. It had been home to an advanced civilisation, located in what is now the Pacific Ocean. It was almost completely sunk 60,000 years ago, with the Hawaiian Islands and Easter Island being virtually the sole traces left of it. He called his main source of information ‘the Naacal tablets’, which said he had deciphered after being taught the Naacal language (apparently the original language of all humanity) by a Hindu priest in India during the famine of 1866 (although he also claimed to have seen them in Tibet); he would have been fourteen or fifteen at the time! Although the monk had no idea what the tablets contained, and in spite of having no formal linguistics training whatsoever, Churchward was able to translate the tablets (partly through psychic inspiration) and so learned the history of the lost continent. In addition to the Naacal tablets, Churchward publicised others found by the geologist William Niven (1850-1937) at San Miguel Amantla, Mexico, which he claimed tell the same story. He had seen them during his travels in Central America, which seem to be even worse documented than his travels in India and Tibet; somewhere in a Central American jungle, he was apparently attacked by a flying serpent! According to Churchward’s reading of the tablets, the first humans had appeared in Mu two million years ago; the population grew to 64 million but was almost completely destroyed with the continent. The survivors were the ancestors of all the remaining peoples of the world, who carried elements of their culture with them. The continent itself was plunged beneath the waves when the subterranean ‘gas belts’ on which it rested collapsed. Elsewhere, the gas ignited, creating mountain ranges (which, according to Churchward, had not existed previously). Curiously, Churchward was not the first person to ‘discover’ Mu, although he never mentioned this. It was the name of the sunken land in Brasseur de Bourbourg’s ‘translation’ of the Troano Codex, although Ignatius Donnelly and Auguste le Plongeon (1826-1908) had identified it with Atlantis. The location of Churchward’s Mu owed more to the Theosophists’ Lemuria and he seems to have regarded the recurrence of the phoneme mu as significant, apparently not understanding the latter name to be modern and based on the word ‘lemur’. The Naacal tablets are a more intractable problem. Since Churchward never revealed the location of the ‘secret’ Indian monastery where he saw and translated them and no known monastery has claimed to possess the tablets, their existence cannot now be confirmed, nor can they be studied independently of Churchward. He said that he had shown a friend the tablets; he did not reveal the identity of the friend, nor did anyone ever come forward as this person. The Mexican tablets, unlike the Indian (or Tibetan) examples, have been identified, but no one other than Churchward has ever claimed them to be ‘tablets’: they are flattened figurines that the locals made in recent times as aids to prayer and worship. There is no evidence that the Naacal ever existed outside Churchward’s over-fertile imagination: every reference to them links back to Churchward – no one knows where or when they lived, and they left absolutely no evidence of their existence outside the tablets Churchward claimed to have deciphered. Moreover, there is no evidence that the tablets existed, either, despite a recent claim on his great-grandson’s website that they have been relocated in a tunnel system beneath the Sri Ekambaranatha temple in Kanchipuram (Tamilnadu, India) by one Thomas Ritter. As soon as we look for confirmation of just about any of Churchward’s assertions, we fail to find any and the only reasonable conclusion to draw is that Churchward invented almost everything in his books. In other words, he was a fraud whose works owe more to fantasy than to scholarship. Nevertheless, Mu has entered the fringe literature, where authors are rarely fussy about checking their sources for confirmation. Alas, the story was a hoax. The author’s name is an anagram of ‘Not Really’, whilst the archaeologist is ‘Rednose Rudolph’; by 1976, it had been shown that the hoax was carried out by Raymond Buckland (1934-), who has written extensively on neo-paganism and Wicca. His own website openly lists it among his books. What is not clear, though, is how he would now regard it. Was it a youthful prank? Was it a work of fiction that backfired? Would the author now claim that the account was ‘channelled’? At any rate, it is not further evidence to back up Churchward’s fantasies. i dont have any connections with any archeologist and im not really the type to be exepted by people like that. but i would love to know more about this since my hunger for knowledge grows faster then ever. So my question is, could you please E-mail me with what you know about these skeletons and if they are real. also i found it interresting to note the Natural substance DMT which is in our body and most plants and animals and releases upon sleep and death(it makes people see things and it certainly changed my thinking about spirituality). The pages linked from the index page to various ‘anomalous’ human remains should be a good starting point for understanding these supposedly “million-year-old” modern human remains. These include some of the examples cited in the video. Michael Cremo’s way of using old data is to go back to the original reports, which often misunderstand principles that modern archaeologists take for granted. The most important is the idea of stratigraphy: this is the idea that layers build up through time, with the oldest at the bottom of the sequence and the youngest at the top. Where things become complicated – and were often not understood a hundred years ago – is when people cut down through later layers to dig pits, ditches, graves and so on. There is good evidence that a lot of the skeletons that Cremo quotes as coming from very remote eras were actually from graves cut into those much earlier deposits. What I find especially interesting is that, if Cremo is right about these very ancient humans, they don|’t ever turn up these days. Why are we not finding them? There’s certainly no conspiracy to prevent people learning about such discoveries, if they were to be made: we can put our most recent findings straight out on to the web (and I, for one, always do. The fact that there aren’t any such discoveries being made in the course of archaeologists’ work convinces me that the older examples were wrongly dated. I am 62 years old now. When I was in high school I thought I would like to be an archeologist but instead became an industrial engineer. It seemed to be easier to get a job and support a family. My curiousity of our origin first seriously started in reading the Bible through in 1962. I was 12 then. I saw a lot more in the bible than any religion or church was teaching. Thats when I started to question teachings. My curiousity got the best of me when I was drafted into the Army and found that I had lots of time on my hands. I also attended four different churches, or religions at the time trying to make sense of it all. I spent months in the library going over encyclopedias, and some books to find similiarities in cultures, beliefs, myths and religion. Of interest in my life is the number of truths that have been falsified by even the most scholarly. I wonder who has more credibility. The one that seeks fame and credibility of the masses, or the quiet ones that do their exploration for the love, hobby, or obsession to know. Back to my military service. What I did find throughout the world is the similarities of beliefs, myths, and religion. Stories that except for a different way of telling them were still the same. I don’t want to simplify the definition of our origin, but you find a pattern if you did the same thing throuhout the library that I did. Much like putting a puzzle together. The great thing about encyclopedias is that they chain references together and you can keep going on a trail. One can not determine a solution by only understanding the nature of man, for that only covers the now (our evolution). I have come to believe also that one must forget about putting a time line on life in the past and our development. It only clouds the truth we are seeking. We really don’t know the definition of time as it relates to creation, or evolution. I have come to believe they are one and the same. To differentiate puts seekers off course. As I have grown older my belief in life after death has become stronger. Not for any religious beliefs, but for observance of the life around us. We take it so much for granted that we are just here and try very little to understand the complexity of just even our own bodies and the knowledge it has taken to create it. The complete interaction of every atom, organ, and cell type in the body. Add to that the complexities of nature and everything that interfaces, and survives together. What mechanisms are at work? What energies are at work that are not visible to us. To say we have just evolved oversimplifies the answer to our origin. To cut and dry and too easy to explain. It is easy to put to rest our reason for being, by saying we just evolved. It says we are just a self learning organism of evironment and reaction. At what point did our bodies decide to have two lungs instead of one, two kidneys, two eyes. How did the food change develop with all its different species? What decided what would be made? What setup the ratios and hiearchy of hunted versus the hunter? What developed all the diets for all the species? There are millions of questions being asked everyday, and people seeking a logical and orderly explanation of every part of our existence. We are not conscience in our death of physical life, and in life we are not conscience of death. That seems to be our greatest barrier of understanding our existence. When symmetric multi-cellular organisms took over from fractal based multi-cellular life forms. That was a very long time ago. Didn’t even have vertebrates yet. Symmetry is a common feature of all multi-cellular life forms today. It is possible that Mu had a super volcano (similar to the one in yellowstone) located over the continent. Within a week, the whole continent could have been submerged from falling into the magma crater. It makes sense, because I read that Mu had been formed by volcanoes. Yaaay!!!! New history to prove! But where did you read about Mu being formed by volcanoes? Let’s just look at some basic facts. No-one had ever heard of Mu before Abbé Charles-Étienne Brasseur do Bourboug’s fantasy ‘translation’ of the Troano Codex. His Mu was supposed to have been in the Atlantic Ocean (and conceived as a Mayan name for Atlantis). The ‘translation’ he made of the Troano Codex can now be seen as utterly wrong, as Mayanists are now able to read large parts of the text. It’s an astrological text. 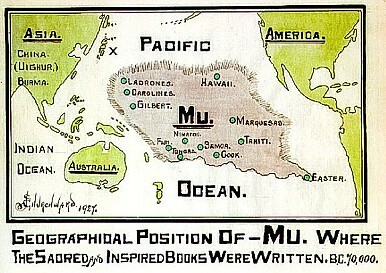 It was James Churchward who shifted the location of Mu into the Pacific. His reasons for doing so are unclear, but his ‘evidence’ consisted of tablets that no-one else has ever seen, a technique of ‘deciphering’ symbols based on the premise that knowledge of Mu was encoded into all manner of very basic shapes, and a very activ imagination. There is no geological evidence that there was ever a continent in the Pacific basin. Indeed, the evidence suggests that it is formed from two tectonic plates (the Pacific Plate and the Nazca Plate), the Pacific Plate being the oldest plate to survive on the planet. No room for a continent there! Where does this leave Mu? In the fantasy lands of Victorian imagination, I’m afraid, supervolcano or no supervolcano. Is it the man or the work that you despise most? The artifacts from both civilizations remain in private hands which prove otherwise but my argument here isn’t whether or not you believe but rather why so malice in your assessment of another’s work! I don’t despise anyone: it’s a very strong word to use. I would say that I’m scornful of claims made without evidence. What is the point of having collections of artefacts that will allegedly prove the existence of these “vanished civilisations” if they’re kept in private hands? Unpublished discoveries are not discoveries: they might as well not exist. And it’s not just the artefacts that need to be published, but a full account of the circumstances of their discovery. An artefact without context is almost as useless as no artefact at all. I really don’t know why you’re so keen to discern “malice” in my criticism of Churchward’s publications. As far as I can see, he made claims based on bad and non-existent data. Not a shred of evidence outside his writings has ever been presented to back them up. As far as I and most of the archaeological community are concerned, the case is closed. It’s a fraud. Without evidence?For thousands of years the oral tradition of Mu has been kept with the aboriginal people of the America’s and Asia.But most people these days are so evidence hungry and believe everything is a lie or a myth which i can understand but we can also become hypocrites . In Peru there are a people that call themselves the Chimu who are residents of Chimor and they have a Glyph attributed to Muror.And there are remnants of the archipelago off the south of Japan.Divers in Okinawa found evidence of this.After the cold war highly detailed maps were available to public that would prove that this was a reality. No, credible proof of the existence of the Naacal Tablets does not exist. Chrysopelea is also known by its common name “flying snake”. It climbs using ridge scales along its belly, pushing against rough bark surface of tree trunks, allowing it to move vertically up a tree. Upon reaching the end of a tree’s branch, the snake continues moving until its tail dangles from the branch’s end. It then makes a J-shape bend, leans forward to select the level of inclination it wishes to use to control its flight path, as well as selecting a desired landing area. Once it decides on a destination, it propels itself by thrusting its body up and away from the tree, sucking in its abdomen and flaring out its ribs to turn its body into a “pseudo concave wing”, all the while making a continual serpentine motion of lateral undulation parallel to the ground to stabilise its direction in midair in order to land safely. I have encountered these when I was stationed in the Philippines. Limited to Southern China, India and Southeast Asian Areas. As to actually attacking a human? From my experience and Jungle Warfare Environment Training…not so much unless cornered or you offer your hand/fingers to them up close (not a good idea as they are venomous). Could it be that the Earll/Buckland book was a skeptics way of demonstrating how simple it is to put one over on a gullible public?